Question about pricing for a scarf that she received from a friends that she wishes to order another of. 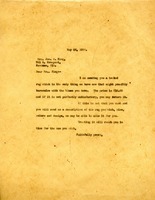 Paul sends a new mailing address and inquires about the status of her order for a woven table doiley. Sample towel will be sent to Berry if needed. 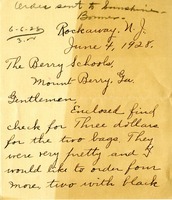 Roberta D. Carnes writes to ask if there is a way to purchase books about the Berry Schools that would earn the Schools a commission. 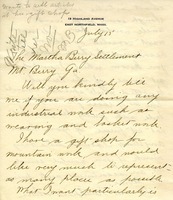 She speaks of her visit to the school with the Georgia Women's Temperance Union and her desire to help the work of the Schools. 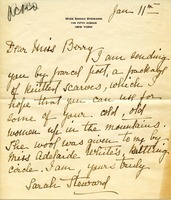 Miss Steward sends some knitted scarves to be given to the "cold, old women up in the mountains." 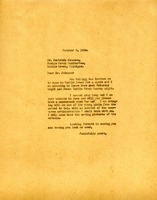 Letter from Mrs. E.J. 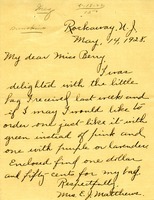 Matthews to Miss Berry thanking her for a little bag she had received, and ordering two more and paying $1.50. 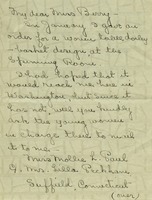 Letter concerns a blue slumber robe sent to Mrs. Klahr when a white robe had been ordered. 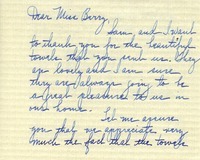 Martha Berry sends Mrs. King a hooked rug, the only thing they have that might harmonize with Mrs. King's blues. 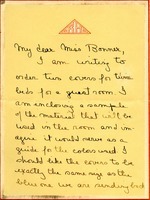 She says that if this rug is not what Mrs. King wants, she should write a description of the rug she wants and the girls may be able to make it for her. 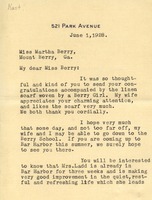 Mr. Kast thanks Martha Berry for the woven, linen scarf she sent from Berry. 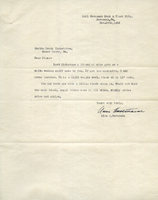 Hammond orders bed covers and pillow shams, giving specifics about colors and design.